I am an interdisciplinary scientist, with a first class undergraduate masters degree in Geoscience, a postgraduate masters degree in Biological Science and a PhD in Palaeontology. MSci Hons. Geoscience, Royal Holloway, University of London, 1998-2002. 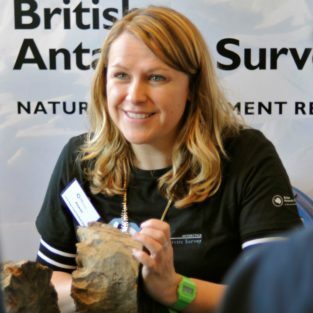 As a palaeobiologist at the British Antarctic Survey, my recent research has focussed on the evolution of polar ecosystems on several different levels, from tracing the history of individual taxa through time to looking at the interaction of taxa and the community structure as a whole. These studies have also examined the interaction and evolution of biota through changing climatic and tectonic regimes. Griffiths, H. J., Whittle, R.J., Roberts, S. J., Belchier, M., Linse, K. and Thatje, S. (2014) Chapter 5.21. Decapoda: crabs & lobsters. De Broyer C., Koubbi P., Griffiths H.J., Raymond B., Udekem d’Acoz C. d’, et al. (eds.). Biogeographic Atlas of the Southern Ocean. Scientific Committee on Antarctic Research, Cambridge. Whittle, R.J., Hunter, A.W., Cantrill, D.J., McNamara, K.J. 2018. Globally discordant Isocrinida (Crinoidea)migration confirms asynchronous Marine Mesozoic Revolution. Communications Biology, 1, doi:10.1038/s42003-018-0048-0. Witts, J. D., Whittle, R.J., Wignall, P. B., Crame, J. A., Francis, J. E., Newton, R. J., Bowman, V. C.(2016). Macrofossil evidence for a rapid and severe Cretaceous–Paleogene mass extinction in Antarctica. Nature Communications. 7:11738. Quaglio, F., Whittle, R. J., Gaździcki, A. and Guimarães Simões, M. 2010. A new fossil Adamussium (Bivalvia: Pectinidae) from Antarctica. Polish Polar Research, 31(4), 291–302. Whittle, R. J., Gabbott, S. E., Aldridge, R. J. and Theron, J. N. 2008. Late Ordovician (Hirnantian) scolecodont clusters from the Soom Shale Lagerstätte, South Africa. Journal of Micropalaeontology, 27, 147–159.